Welcome to Railroad Picture Archives! 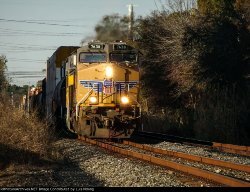 This site contains a large collection of railroad pictures. You will find photographs of many different railroads! Browse the collection by locomotives present in the photograph, by the location the photograph was taken, or by locomotive model. Visit the contributor sites to see the collection of an individual contributor. Check out our interactive U.S. railroad map! Each location a photograph was taken will appear on the map as a red dot. You can zoom in and out to see detailed track configurations all across the U.S. Registered users will have access to our U.S. Traffic Density map. Quickly find the busiest lines near you! Traffic Density Map 2014 data update! New Feature: Heritage Units! The locomotive search tool has been enhanced to support searching for heritage locomotives. Follow the link to the locomotive search, type in heritage in the tag field and search! More locomotive tags will be added in the future. Want to contribute? It's free! First register for a user account by clicking on the 'Register' link on the left. Once you have registered simply log into the site and click the Contribute link and follow the simple instructions! The editors of this site will be selecting the best and most interesting photos as they come onto the site. Each photo that is selected as an editors pick will have a red award icon visible on the top of the picture view page. You can see the most recent editors picks by selecting the Editors' Picks link from the menu on the left. You can see the contributor's favorite photos by going to the Contributor Picks link on the left. On the Contributor's individual site, their picks will be accessible through the My Picks Link. Each photo that is selected as an contributor pick will have a green award icon visible on the top of the picture view page. Want to see the most recent photos added to the site all in one screen? Click the Newest Photos at the top left and see all photos added to the site within a specified number of days. This is a great way to see all of the newest photos on one page!